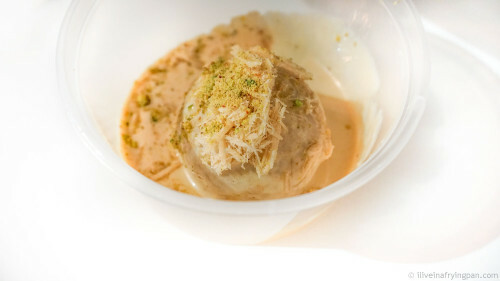 This post was meant to be a broad overview of my experience at the Qatar International Food Festival last month, but after waxing 997 words eloquent solely about Rahash, I decided to get this ravishing dessert out of my system so that I can process everything else I ate in another post. 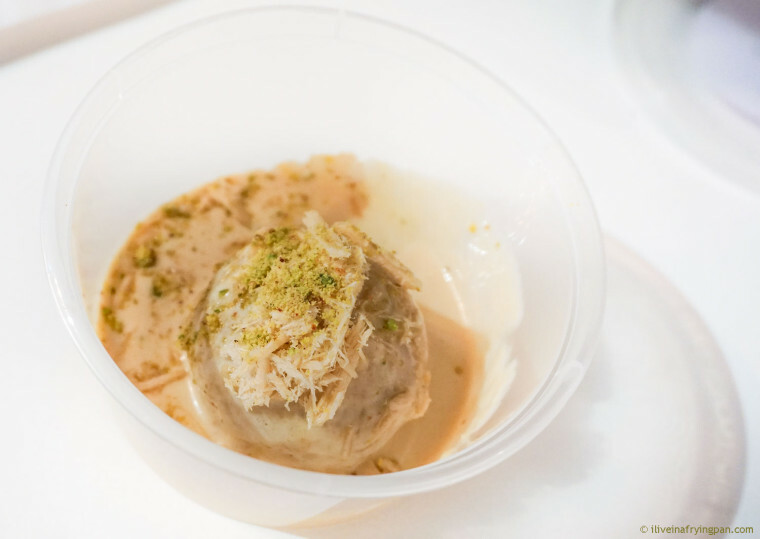 So here's a post dedicated to the flavour that rocked my sweet tooth in Qatar – and which will forever leave me wondering if I can infect every possible dessert at home with this regionally relevant, texturally brilliant sweet nutty concoction. Rahash is a sweet milky tahini-based halwa which is an addictive form of Middle Eastern nutty fudge. It sticks to your teeth like toffee, scrapes against your tongue like sand and dissolves down your throat like cream. It arrests taste buds at that enticing junction where savoury nut-butter strands cross paths with sweet cream. It is that ingenious play on texture and flavour that never blinked on my radar until my time at the Qatar International Food Festival. And it was at the festival that I found myself absolutely smitten by this newfound flavour, to the point where I ran horribly late photographing a tantalizing rahash cake, nearly had a meltdown when the popcorn stand ran out of rahash popcorn, and strategized with a bakery owner about how to carry her rahash creation back home on the flight to Dubai. Here is the Rahash trail that I slavishly pursued when I visited Qatar. If you had to prioritize, pick the first one. If you don’t try anything from the list at all, you won’t experience Rahash. And that my friend, is punishment enough. This was what awoke the sleeping Rahash hound in me – the Rahash bomb from a homegrown business called Fenyal which specializes in cupcakes and cake balls. This edible bomb is soaked in rahash sauce and covered in more flaky tongue-sticking rahash procured from Kuwait, supposedly a respected source of the best quality rahash. The bomb spurts out luscious cream from within, a cream that I can’t quite describe because the nutty creamy toffee-like fudgy texture of the rahash-soaked sphere short-circuited the analytical food gadgetry in my head. To make up for my verbal incompetence, here's an instagram video on the fenyal rahash mind-bombing experience by Aziz Alajail, @zozalajail. Warning, it might leave you curled in up the foetal position and craving something that's miles away. Thanks for helping me relive this mind-bombing experience Shaima. You just gave me my new desktop screensaver. Fenyal’s owner Umm Mishaal is a force to reckon with – she baked up a storm for the festival despite being injured AND being on crutches AND having just emerged from another hectic event. 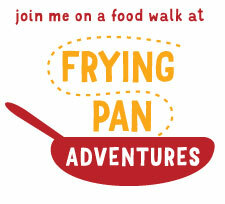 I walked away feeling profoundly inspired and deeply incompetent. Where to find it: Fenyal is an Instagram-based home business: @fenyal. Details on how to order in their Instagram profile. The second rahash revelation was at a gourmet Kuwaiti-born popcorn brand, Let’s Popcorn. 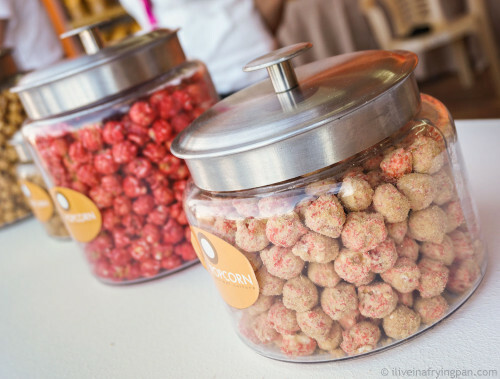 This franchise has wrapped their popcorn kernels in a slew of sweet, salty and spicy flavours that resonate with the region, with my obvious flavour of choice being the sweet creamy rahash and rosewater. I will admit that the tahini renders the popcorn somewhat chewy and even powdery, a big no-no for any popcorn purist. But if you masticate thoughtfully enough, you’ll feel the rush of sweet rosy tahini comfort wash over you and wipe clean any misgivings about chewy popcorn. I’ve taste tested this oddly-textured, comfortingly flavoured popcorn with a few people now – and about 80% have dipped into my bag for seconds. The remaining 20% didn’t deserve my preciously popped rahash stash anyway. Where to find it: They have two branches in Qatar, the Al Aziziya branch and Souq Waqif. More information here. 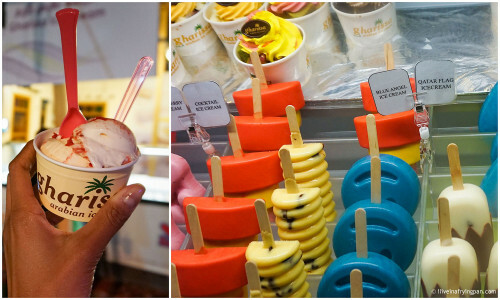 While I caved into a more Westernized scoop studded with nibbly bits of cake (pictured below), I did manage to taste the more interesting rahash ice cream from Gharissa, a store founded by Ghanem and his mother Eman. Gharissa is part of a bigger heart-warming story, one where Ghanem was born with caudal regression syndrome (CRS) which left his lower body completely paralyzed. Despite the severe adversity, Ghanem has become a national icon of hope and motivation. Not only has he written inspirational books in English and Arabic, but he is also the youngest entrepreneur in Qatar behind the Gharissa brand. The rahash ice cream tasting left me inspired to try my own version over the summer – maybe sweet tahini cream with sticky swirls of rutab date fudge. You're instinctively licking my invisible rahash-dates scoop in the air aren't you? So am I. Where to find it: The Barwa Village, Al Wakrah, Al Khor Mall and Dar Al Salaam. More information here. 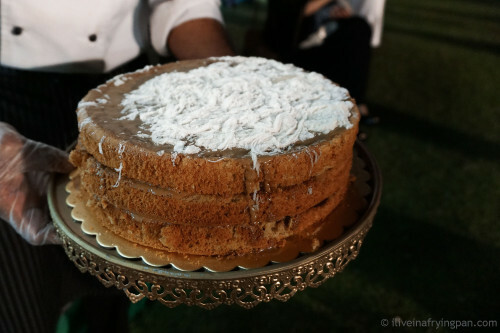 The final rahash creation that has great potential for bakeries in the region was a rahash cake from the Souq Waqif Boutique Hotels. The cake was covered in fairy floss and layered with an unctuous sticky rahash caramel that leaves you licking the spoon long after there’s nothing left on it. The cake itself turned out a tad bit dry, but a mental replay of its rahash filling with a moist buttermilk cake has convinced me that rahash with cake is a combo meant to be. I’ve also heard murmurings of cakes with rahash melted into chocolate sauce, the very thought of which has left me shaking uncontrollably like the bobble heads on sale at the gift store under my apartment. Where to find it: Café Brouq in Al Mirqab Boutique Hotel at Souq Waqif Boutique Hotels. If you're based in Dubai, don't sob over our rahashless fate in the city - Doha is a mere 45 minute plane ride away. Or alternatively, I’ve managed to lay my hands on pure unadulterated blocks of Iranian-style Rahash in that jungle called Naif behind the Gold Souk. Shameless plug, but join me on a ‘Naif by Night’ photo walk to taste Rahash, buy your own personal stash, and whip it up with some gooey Nutella so you can plaster Instagram with the most outrageously lickable Rahash photos. 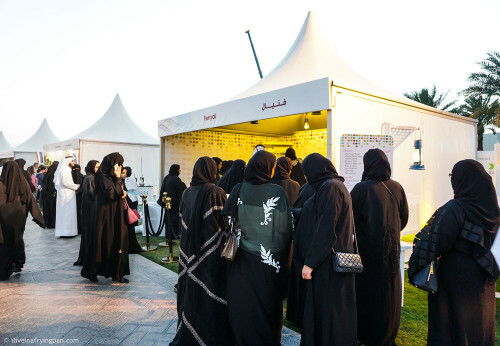 Disclaimer: While my trip to Qatar for the Qatar International Food Festival 2015 was graciously sponsored by the Qatar Tourism Authority, all opinions in this post are expressly my own. All credits to: The gorgeous and generous Shaima Al Tamimi who co-blogs at http://potsandpatterns.com/ . She was the one who kickstarted my ‘RahashRush’ by alerting me to the Rahash bomb at Fenyal. The rest is history. Not a good thing to read about Rahash the first thing in the morning. But if it has to be, it has to be. Rahash with gooey nutella… oh god, damn my sugar levels! Wow, the only thing I’ve come close to trying with a similar flavor are those tahini halawa packets you get at the supermarket from Halwani Bros, and those are so addictive I can’t imagine what actual good quality rahash would do! Ou nou you totally infected me with Rahash fever. I must book a tout to Naif by Night. Have to explorer Naif and get my hands on or rather my mouth in to Rahash. See you soon at Naif!